This week we had one of our quite rare all of CETIS staff meetings. During the discussions over the two days, communication and how to be smarter, better at sharing what we do amongst ourselves was a recurring theme. If you keep up with the CETIS news feed you’ll probably realise that we cover quite large range of activities and that’s only the “stuff” we blog about. It doesn’t represent all of our working activities. This morning I was reminded of another time-based aggregation service called memolane. Being a bit of a sucker for these kind of things I had signed up to it last year, but actually had forgotten all about it. However I did have another look today and set up JISC CETIS account with RSS feeds from our twitter account and our news and features; and I was pleasantly surprised. The screenshot below gives an indication of the timeline. The team at memolane have released embedding functionality, but as we are super-spam-conscious here our wordpress installation doesn’t like to embed things. I have to also add that the memolane team were super quick at picking on a tweet about embedding and have been really helpful. Top marks for customer service. As a quick and easy way to create and share aspects of a collective memory of organisational activities and output, I think this has real potential. I also think that this could also be useful for projects as a collective memory of their activities (you can of course and multiple feeds from youtube, slideshare etc too). I’d be interested in hearing your thoughts – is this something that actually might only make sense for us and our funders? 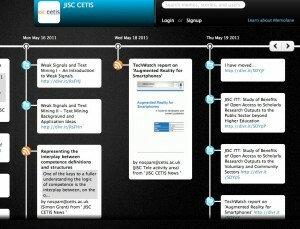 Or do you think this type of thing would be useful in a more visible section of the CETIS website? The embed feature now works! This entry was posted in cetis-communications, web 2.0. Bookmark the permalink. Ooh look! I think this looks like an excellent way to provide a visual representation of the breadth of our work in any given area. I will have to write an OER Support Project final report later in the year and this could provide a very useful illustration of project outputs. I also think it could also be a really good way to get a quick overview of individual colleagues work. At UKOLN we are looking for a light-weight, easy-to-use service that could create an online events/wall planner type calendar thing. Memolane looks like a possible option. Am definitley going to investigate. Do you know of anything similar that is also worth looking at? Thanks John, looks good and Marieke how about dipity? Hi Sheila, this also looks as if it could be a useful tool in the e-portfolio-promoting-reflection space. Look back and see how something (or someone, particularly oneself!) has evolved / grown / developed over time, having the service do the time-based collation. Yes, there are a number of services which do this kind of aggregation but there is just something about the simplicity of this interface I particularly like. Thanks for sharing this. I have been looking for something like this for ages! I am going to test it immediately. And Simon, wouldn’t it be great if such a timeline could be generated automatically from the ePortfolio artefacts (or partly, as a basis that one could then reflect upon and improve)? My previous comment is not very clear, sorry. What I mean by “from the ePortfolio artefacts” is that the timeline would not only be populated by the artefacts themselves (as in Memolane) but, for example, by an aggregation of the topics or typical words used by the learner over a period of time. This would provide the learner with a visual representation of her/his understanding (as well as of her/his productions). This could be an interesting added-value to the affort of compiling and reflecting that the ePortfolio user is expected to embark on, which he could not easily manage to get otherwise. It should not however be a completely automatic process because seeing the resulting timeline, the learner might be interested in adjusting some elements. Thanks for your comments – you might want to look at dipity – that has some more functionality like keyword searches in twitter and the ability for a user to add their own “events” – an example http://www.dipity.com/sheilmcn/JISC_CETIS_EVENTS_2/ (NB I’m using the free version so there are ads).